Let’s start with the obvious: Arcade Fire isn’t folk music. And if you’re an older folk fan, or just generally not alt-Top 40 savvy, you may barely recognize the bandname, though one or two songs may sound familiar, thanks to the everpresent periphery of Starbucks soundtracks and hipster radio. But the purpose of Cover Lay Down is to connect fans with artists through the comfort of coverage. Our Covered In Folk series has taken on the songbooks of influential artists from Dolly Parton and Jimi Hendrix to Radiohead, Pavement, and The Bee Gees; we recognize that our subjective listening histories contain volumes, and that familiarity is where you find it. And by this standard, Arcade Fire is worth knowing – both because the band is no mere footnote in the history of 21st century music, and because in just a decade, the young indie-rock influencers, built around the songwriting-partnership-turned romance of husband-and-wife duo Win Butler and Régine Chassagne, have crafted a body of songs that have caught the ears and minds of a rising generation of artists who self-define as folk. Today, then, we turn our attention to the songs of Arcade Fire, as covered by a diverse set of young singer-songwriters from across the folk and acoustic genres. As always, if you like what you hear, follow the threads below to learn more about the artists we celebrate. History first: although a version of Arcade Fire was formed by Butler and a few other players in Boston around the turn of the century, the band identifies as Canadian, tracing its official founding to the Montreal art gallery where Butler discovered Chassagne singing jazz standards. The band would spend the next three years honing their unusual combination of eclectic influences into “a mix of bossa nova, punk, French chanson, and classically tinged pop music,” gathering in players, and developing a local following through small venue performances and a self-pressed EP that caught the ears of Merge Records. From there, their rise to fame was swift indeed. Pitchfork named their cathartic 2004 debut Funeral among their top ten albums of the year; they toured with U2, and played both Lollapalooza and Coachella. Subsequent albums Neon Bible (2007) and The Suburbs (2010) topped the Billboard charts. “Alternative radio” listeners and Top 40 aficionados alike became familiar with their sound and sensibility. And with a second appearance on Saturday Night Live in 2010, theirs was a household name, at least among the cool kids. Arcade Fire is an expansive indie rock band with elements of both post-punk and baroque pop in the mix, and they’ve sounded like it all along; with but three albums under their belt, their songbook is small, though a fourth album due this October will expand their repertoire. But under all that pulsing beat and unapologetically theatrical performance, the combination of deep lyrics, dark majesty, and smart, fragile, hook-driven melodies strike a deserved chord with the disillusioned masses. Where such broad fandom is found, tribute is bound to follow. And follow it does, in spades. 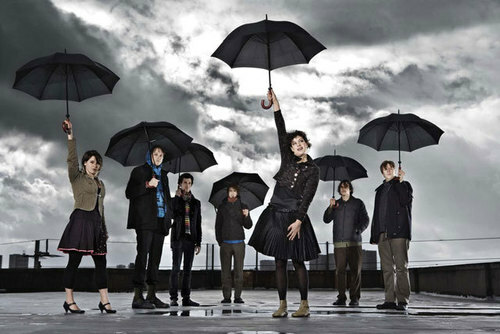 The covers of Arcade Fire which catch the imagination run predominantly popfolk and indie, as befits a band that rose to prominence after the millennium, and is often hailed (ironically and unironically) for bringing indie to the mainstream, especially since winning a Grammy for Album of the Year (thus retaining their indie cred by becoming the only artist to date to win in only that category). Even on the popfolk side, the dominant players are artists on the fringe: young singer-songwriters, social-media savvy, who know how to ply the modern as a vehicle for fan base. We’re not knocking this approach, of course: by definition, Cover Lay Down celebrates and respects coverage as a vehicle of comfort. But even as the covers run the gamut, stirring the imagination of a vast swath of styles and artists, don’t let the genre spread fool you. Arcade Fire’s lyrics are a consistent thread, socially aware, painfully personal, and thematically deep, as evidenced by the heady journeys of their albums themselves, and by their own choices of coversongs: their Talking Heads cover, heard below as a bonus track, is hoarse and heated, and shockingly sparse; their version of Games Without Frontiers, which will appear on long-awaited Peter Gabriel tribute And I’ll Scratch Yours in September, is darker and more hollow than the original, which is saying something. The spread of their peer coverage is quite diverse, too, with several takes per original album speaking to a consistency in composition throughout the band’s wild ride to fame. A greatest hits collection, then: of Arcade Fire treated tenderly, and with passion; of modern homage, in the spirit of sharing, and of folk writ large. A tense, pulsing take from Lazy Days, American folk artist Ana Egge‘s slow, sunny all-covers tribute to classic pop-and-rock songs of summer. A driving, echoey living room version of the anthemic 2007 single from up-and-coming YouTube star Kiersten Holine. Tense violins that burst into pop from Brooklyn-based multi-instrumentalist Ace Reporter contrast nicely with Clare Burson‘s gently aching neo-classical singer-songwriter indiefolk. Of many covers of this Arcade Fire title cut on Soundcloud, these – amateur Anna Silva‘s sparse, ringing solo take, and a string-driven swooner from cinematic composer/violinist Chrysanthe – stands out for their depth and diversity of song exposure. Acoustic indie pop duo This Is Ivy League goes lovely and bittersweet with hushed harmonies and an Iron & Wine indie vibe. Live looped fiddle and vocals make for a tense and trembling take on what was once a crashing pop song from indie darling Owen Pallett, aka Final Fantasy. Gently rhythmic solo acoustic folk from Happe Days on Plymouth Drive, Andrew Krolikowski’s pensive tribute to loss. Arcade Fire’s most haunted, in triplicate: a soaring piano-and-strings popfolk build from Sara Lov, slippery, sparse jazzfolk from Anna Rose, and the warm, close harmonies and banjo of recently featured Falcon Ridge Folk Fest Emerging Artist folksters Bobtown. Indie collective Calexico brings their crashing alt-country to bear on a cover originally released by Arcade Fire themselves as a b-side for Intervention. A truly soft, summery nufolk field recording from East-meets-west singer-songwriter Wilderthorn; a coarser, more broken BBC session version from Scottish singer-songwriter Paolo Nutini. Norwegian indie singer-songwriter Ane Brun comes through with a clear, chilling acoustic take on this Funeral cut..
UK social media covermaster Benjamin Francis Leftwich drowns whispered vocals in waves of sound; for an alternate, more traditional approach, check out the upbeat bluegrass spin Trampled By Turtles brings to their AV Club cover. A bonus track, recorded in-studio in 2009. Not folk, per se – but a fun and fitting capstone for our Arcade Fire mixtape, all the same. Download our entire 18-track Arcade Fire coverfolk mix here!